Comm Eye Health Vol. 19 No. 60 2006 pp 65-66. Published online 01 December 2006. The Fred Hollows Foundation, 4 Mitchell Street, Enfield NSW 2136, Australia. Postal Address: Locked Bag 3100, Burwood NSW 1805,Australia. 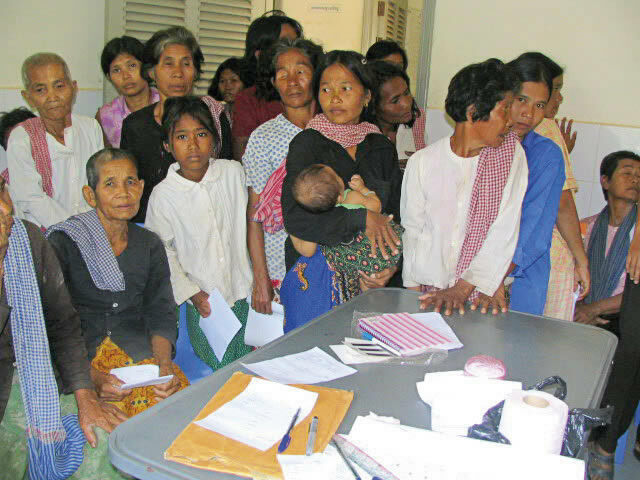 Angdoung Hospital, PO Box 2027, Phnom Penh, Cambodia. 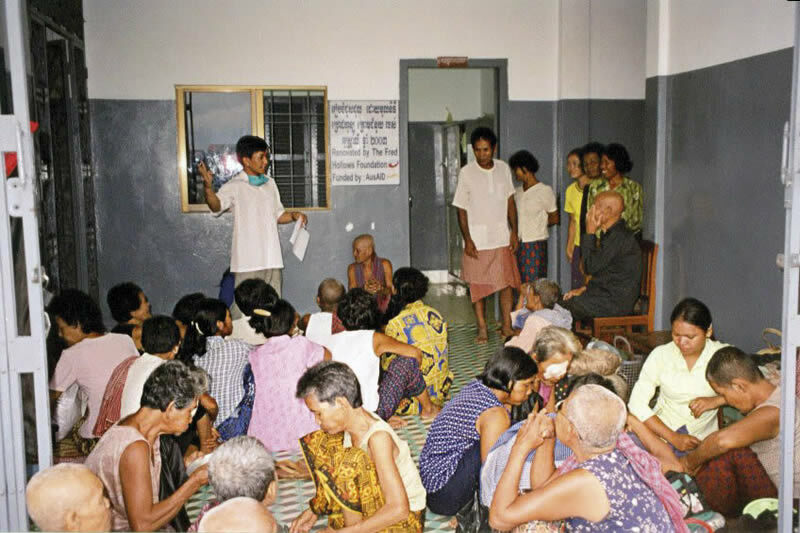 Following decades of civil disturbance in Cambodia, by the early 1990s there were few doctors remaining in the country, and little in the way of eye care services. With NGO support, training centres were established to train medical graduates and nurses as ‘basic eye doctors’ and ‘basic eye nurses’. These workers were then placed in provincial eye units to serve the eye care needs of those provinces. However, it soon became clear that, despite evidence that blindness, including cataract blindness, was prevalent, patients were not attending these provincial eye units. Attention was therefore given to finding out more about the barriers preventing patients benefiting from these services. This is an underlying factor, one survey having rated over 90 per cent of the referred patients as ‘poor’ or ‘very poor’. Even when the actual operation is free, the associated costs of transport and food, when patients are away from home, are often too much for patients to afford. Many will simply not consider seeking services, assuming such services will be beyond their means. Poverty interconnects with other barriers, such as the lack of someone to accompany and care for the patient while in hospital. A caretaker would need to take time away from their work; for many poor people, this could have a significant impact on the family income and contribute further to household impoverishment. In rural economies, potential caretakers can often not afford to spend a day away, particularly during harvesting season. Linked to poverty, are the attitudes to spending scarce resources on the elderly. We found that children, and the patients themselves, do not perceive the need or value in spending resources on medical care of the elderly patients. This includes the direct fear of having a poor outcome from the operation, and a less rational fear of the whole concept of surgery and hospitals. Lack of knowledge has to some extent been addressed through efforts to educate the population about the availability and quality of eye care services. However, lack of a clear understanding of the nature of cataract, and of the possibility of treating it, is often still found to be a barrier to uptake of surgical services. In some communities there is a prevailing attitude of mistrust of locally trained surgeons, combined with the feeling that foreign doctors are better. This is compounded when a foreign surgical team arrives (often unannounced) and does free surgery, undermining the good work and trust being built up by the local eye doctor. 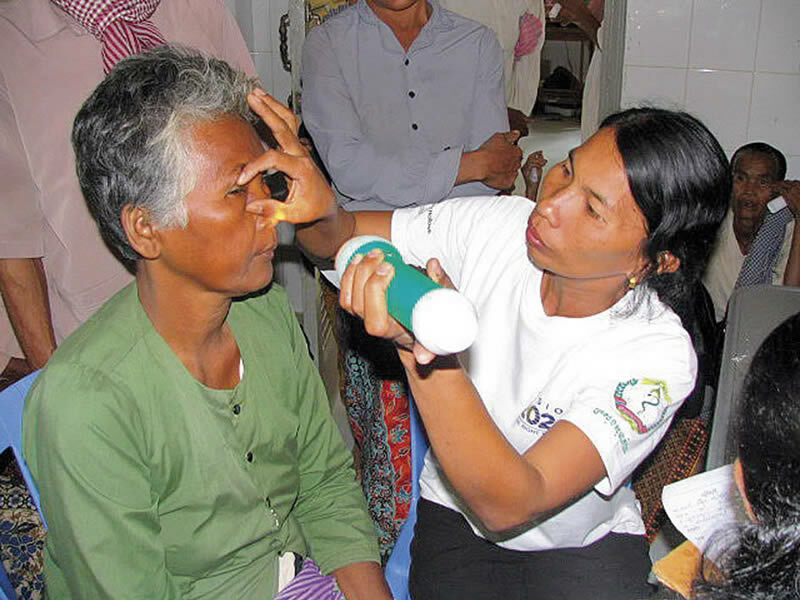 The National Programme for Eye Health (NPEH), eye units working with NPEH initiatives or with NGO support, and individual eye doctors in Cambodia, have attempted a range of approaches to overcome these barriers. These are briefly described below. Outreach screening activities for cataract or other causes of blindness extend the reach of provincial or district eye unit to the surrounding community. The doctor, supported by the unit eye nurses, or the nurses themselves, usually provide the outreach screening. This is a key method for promoting the uptake of cataract surgery. It provides an opportunity for community education in eye disease and the options for eye care, as well as the actual screening process. However, our experience tells us that providing an outreach screening service does not entirely overcome the barriers to uptake. We find that of those referred to the eye unit at outreach screenings, only around 40 to 50 per cent actually attend for surgery. The reasons for this appear to be similar to the key barriers described above. While outreach screening can result in a disappointing proportion of referred patients attending for surgery, it provides the opportunity to address some of the problems at their source. These activities help to create understanding about the nature of curable blindness, address concerns about cost and the need for caretakers to accompany patients to hospital, and dispel fear of the operation. The outreach screening is a good forum for addressing people’s concerns, although it is important to ensure that there are enough resources available to give this the time it needs during a busy outreach session. Financial subsidy for surgery (and often for other associated costs such as transport and food) is necessary to obtain a good ‘yield’ of referred patients. In many people’s minds, there is a link between eye camps run in in collaboration with an NGO and the opportunity for free surgery. Free surgery might also be provided in the context of World Sight Day or other advertised periods. Hospitals often have a degree of flexibility in fees charged as part of a cost recovery system, and they often work in co-operation with the eye unit staff or community rehabilitation bodies in administering this. Training village health volunteers in primary eye care and screening for cataract facilitates the screening process. In one case, the Chief of Training of the hospital has taken on the role of teaching the village volunteers and conducting outreach screening with them. In another case, the eye unit returns a subsidy of one dollar to the village volunteers for each cataract patient referred. Involvement of satisfied patients has also been tried. One doctor makes it a practice to have a person in the screening area who has had successful cataract surgery; the satisfied patient can then explain the process and encourage others to have the operation. Reducing the fear of the cataract operation As mentioned earlier, one approach to reducing fear is to allow enough time and resources during outreach activities for discussion with people. In any communications about cataract, the words used can make a difference. For example, one unit has found that words such as ‘surgery’ and ‘hospital’ create fear, while words like ‘remove the cataract’ create more confidence. One well-established way to reduce patients’ fear of surgery is the use of ‘ambassadors’. These are people who have had successful cataract surgery. They are urged to talk to people who are blind when they return home and to encourage others to receive the same benefits as they have. One doctor takes this one step further by telling patients, after a successful first eye, that he will only do the second eye if the patient brings another cataract patient along with him! Establishing a personal relationship of trust is the key to reducing fear of surgery in the patients. All this knowledge and information will be of little value if the patient does not understand or trust the medical staff. when a person is in hospital without someone to care for them, the hospital social services or the NGO can arrange for someone to be the caretaker. using screening camps to increase knowledge of eye care. Barriers to the use of cataract services will only be removed with time, community education, and reduced poverty. In the meantime, quality medical care, delivered in a way that is sensitive to the needs of the patients, and returning good outcomes to the community, will form the basis of better uptake of cataract surgery in the future. The authors would like to acknowledge the contribution of material by Dr Manfred Mörchen and Sith Sam Ath.